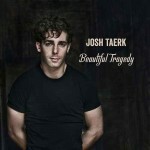 Share the post "Album review: JOSH TAERK – Beautiful Tragedy"
Josh Taerk returns with a new album his first since 2015′s ‘Here’s To Change’, although four of the songs on here were on last year’s ‘Stages’ EP. Teddy Morgan (Kevin Costner and Modern West, Carl Broemel) produces again, with Josh co-producing on three songs. It is a bit of a family affair at times with Ryan and Matt Taerk contributing backing vocals. Opening with the catchy refrain of the title track, the eight songs on here are amongst his best work to date. For gentler, reflective tunes look no further than ‘Anywhere Love Took Us’ or ‘After The Fall’ – a song that is made for a film soundtrack, particularly with the strings backing and big production sound. Speaking of production, the musicianship on here is top draw, be it the organ and drums on ‘Beauty Queen’ or the sublime guitar solo on the country flavoured ’Neverland’. ‘Midnight Mustang’ shows off the rockier end of his work, as Josh himself says ‘I’ve never fit into just one category, I’m influenced and inspired by a lot of different elements’. That is one good selling point if you like that he doesn’t stick to one style or genre of music. Josh Taerk successfully melds a memorable melody for those who love a great hook, along with thought provoking lyrics for those who like a little substance to their musical listening. Could you take us through the songs on your new album ‘Beautiful Tragedy’ – story behind the songs, recording process etc. The recording process of the album was really exciting, because it felt like I’d come full circle with my music. I co-produced the album with my friend Teddy Morgan at The Sound Emporium Studio B and Barrio East studios in Nashville TN. I then took the tracks back to my hometown of Toronto where we finished the record and recorded vocals at The Orange Lounge. It was really cool taking this album back to my hometown from Nashville. It was like bringing everything that I had become back to where it all began. “Beautiful Tragedy,” is a story about two people who, no matter how hard they try to make it work, realize that they just aren’t meant to be together. I started writing this song after a show in London England. I got back to my hotel around 2 am, and just as I was about to go to sleep the first two lines flew into my mind. I spent the next hour or so writing the song and then brought it back home to work on the arrangement with my brothers Ryan and Matt a couple days after the tour. “Neverland,” is about love. Love is addictive. It’s intoxicating, it’s ecstasy. Love is surrender, it’s bliss, it’s the closest thing to heaven we’ll ever experience in this life, the highest high you will ever feel, and takes you places you’ve never even dreamed were possible. I got to write this song in Nashville with my friends Teddy Morgan and Jack Williams. I had only herd stories of Jack from Teddy before this writing session, and Teddy and I were catching up after being on the road for a bit while we were waiting for Jack to get there. Suddenly, the energy in the room changed and before I knew what was going on this tall, slim, silhouette filled the doorway. Then this deep, gravely, low southern rasp came out of this figure now stepping into the light. Jack said, “You must be Josh, heard a lot about you man. I’ve been listening to your songs and I like em’ In fact, I got the perfect title for a new one. How about, You’re my Neverland.” How could I argue with that? I wrote “Midnight Mustang,” in Denver Colorado. I was visiting a buddy of mine and he invited me to see Kings of Leon play The Red Rocks. One thing led to another and we ended up running into Nathan Followill (Kings Drummer) before the show. We hung out with him for a bit, super nice guy, and then headed to the show. That night, a huge rain storm came through Denver, the temperatures dropped to just about freezing, and Kings came out and played one of the best shows I’ve seen them play. After the show my buddies Matt, Raph and I, still so energized from the show, hung out well into the morning and pretty soon it was time for me to catch my flight. I hopped in the Uber reliving the excitement and energy of the night before. We pulled into the airport and there was this huge statue I had never seen before right as you entered the airport. It was a Mustang, powerfully rearing up as if to say, “try and soften my edges, try and tame me. I dare you.” The statue was painted midnight blue. “After The Fall,” was the first co-write between my brother Ryan and I. Sometimes things come to an end and endings can be scary, but sometimes things end so that new things can begin. I came up with the idea for “Beauty Queen” while my little sister was finishing her last year of high school. Just watching her and her friends navigate the giant social experiment that is high school inspired me to write a story about true beauty. This was one of the tracks I took back to The Orange Lounge in Toronto with my brothers. We literally got into the vocal booth and started trying stuff, having fun and experimenting. I still can’t help but smile when I hear those vocal tracks come on. Jekyll or Hyde is more of a question than an answer to what I was thinking about when I wrote this song with my brother Ryan. How do we become who we are? Are we born a certain way and stuck like that for life, or do we become who we are through the choices we make? I co-wrote “Learning To Let Go” with Teddy Morgan and it was the first song we wrote together. Every time you write with someone new, you can’t help but wonder how it’s going to go. Are your styles going to click or clash, are you going to be able to be free and create something awesome with this person? When Teddy started playing the opening riff for “Learning To Let Go,” I immediately thought of that first line, “sometimes in life you reach a point of things will never be the same.” That’s when I knew we were going to be just fine. You co-produced a few songs on here with Teddy Morgan. Is this your first time at producing and would you be interested in producing other artists if the opportunity arose? I actually co-produced a Christmas Single back in 2016 and loved being behind the board. This was the first time I co-produced one of my own songs, and it was such an amazing feeling. What I love about writing songs is the freedom it gives me to find creative ways to talk about the experiences I’ve had, things I’m feeling or things people around me are going through. Producing to me is a natural extension of that creativity. The way a song sounds, the instruments used, when certain things come in or get louder or fade into the mix; all of that adds to how the story gets told and received. I loved being a part of bringing my stories to life, from start to finish, and would jump at the chance to be able to help other artists bring their stories and visions of their songs to life. You have been playing in UK quite regularly of late. Have you seen more interest in your music and more people at your shows? I have and I’m so grateful for it not only because more people are coming out to my shows, but also because, to me, it means that my music is reaching and speaking to more and more people. That’s why I write and why I love performing, I love connecting with people. What have you got planned live wise for the rest of the year and into early 2019? The rest of 2018 was awesome because it was full of a lot of touring. I played shows through New York State at the beginning of November and then capped off the year by touring through Michigan, Illinois and Ohio before the holidays. 2019 is already a big year for me because my song “Beautiful Tragedy” is going to Pop Radio in The U.S. January 14th. I’m also playing a bunch of shows in Los Angeles California starting January 22nd and have been invited to the NAMM conference starting the 24th of January. How has the music scene changed for an artist like yourself in the past few years? Does streaming/downloads help your music get known more? Do you still rely on live shows and CD sales to fund new recording/music? I think the ways to get your music heard have definitely changed and grown over the past few years, and I think that streaming is a massive part of how artists get discovered now. CD’s are still pretty important but more so as a memory of the concert than as a way to listen to the music itself. I find I sell tons of CD’s at my shows along with other merch items. I don’t think the core of music has changed all that much though. The business is still built on following your dreams, doing what it takes to make your dreams come true, and being true to the kind of person you are and the stories you want to tell. That part of this business will hopefully never change. I love you all so much! Your messages, comments, seeing you singing my lyrics back to me from the stage; you’re the reason I keep doing what I do, and I’m grateful to be on this journey with you. This entry was posted in ALBUM REVIEWS, ALBUM REVIEWS (Mobile), All Posts, INTERVIEWS, Interviews/Rising Stars, Interviews/Rock Stars and tagged album, Beautiful Tragedy, country, interview, Josh Taerk, melodic, pop, review, rock, singer songwriter. Bookmark the permalink.